These noodles are incredible. Their salty-sweet flavor blends beautifully with the ginger and sesame notes. I make double the amount of sauce just to coat the noodles with more deliciousness! In a small bowl, whisk together soy sauce, garlic, brown sugar, sambal oelek, oyster sauce, ginger, and sesame oil; set aside. In a large pot of boiling salted water, cook pasta according to package instructions; drain well and keep warm..
Heat olive oil in a large skillet over medium high heat. Add shrimp and 2 tablespoons soy sauce mixture, and cook, stirring occasionally, until pink, about 2-3 minutes; set aside. Stir in mushrooms, bell pepper, zucchinis or green beans, and carrot to the skillet. Cook, stirring frequently, until tender-crisp, about 3-4 minutes. Stir in spaghetti, shrimp and remaining soy sauce mixture until well combined, about 2-3 minutes. Serve immediately, garnished with scallions and cilantro, if desired. Time to fly to the Orient to sample some of the excellent dishes we can easily prepare in our northern Maine kitchens. Takeout never tasted as good as your own, freshly prepared, delectable Korean Beef Lettuce Wraps, Sticky Sweet Chicken, or Thai Peanut Chicken Noodles. Korean BBQ can be made at home with these light, refreshing lettuce wraps! These are SO good. They can also be made/prepped ahead of time! I used boneless pork one time, and that was good, too. In a medium bowl, whisk together soy sauce, brown sugar, green onions, garlic, sesame oil, ginger, and cayenne. Reserve ¼ cup and set aside. In a large bowl, combine soy sauce mixture and steak; marinate for at least 1 hour to overnight, turning the bag occasionally. Drain steak from marinade. In a large saucepan of 2 cups water, cook rice according to package instructions; set aside. Preheat a cast iron pan to medium-high heat. Add steak and cook, flipping once and basting with reserved ¼ cup marinade until cooked through, about 1-2 minutes each side. Spoon rice into the center of a lettuce leaf; top with steak, garnish with sesame seeds. Roll up, taco-style. This is a tasty way to prepare chicken. You can use tenders if they are a better bargain at the store. Serve with a green vegetable and rice or noodles. Mix together brown sugar, honey, soy sauce, ginger, garlic and hot sauce or cayenne in a small bowl. Lightly salt and pepper the chicken strips. Heat oil in a large skillet over medium heat. Add chicken and brown quickly about 2 minutes per side till caramelized. Pour sauce over chicken. Simmer uncovered until sauce thickens, 8-10 minutes. The surprising flavor of peanuts gives this dish an unusually delicious edge. Add additional veggies like bean sprouts or pea pods if you like. Whip this up in less than thirty minutes. Flavorful, and can be served as a side or main dish! In a medium bowl, whisk together peanut butter, soy sauce, garlic, honey, ginger, vinegar, sesame oil and Sriracha or Tabasco, if using; set aside. In a large pot of boiling water, add noodles and boil until soft, about 1-2 minutes; drain well. Heat olive oil in a large skillet over medium heat. Add chicken to skillet and cook until golden brown, about 4-6 minutes. Stir in cabbage, carrots and green onions until heated through, about 1 minute. Stir in cooked noodles and peanut butter mixture. Serve immediately, garnished with peanuts, if desired. I failed to post this column on time as I became ill shortly before the holiday! Sorry to all my followers! Here it is, new and improved! Valentine’s Day means expressing your love for your spouse, partner, family, and friends. What better way than to say it with food you lovingly prepare? Here are two suppers and two desserts to consider. Who said you can’t serve seafood with cheese? Ever have a tuna melt? Crab and swiss? Here’s delicious exception perfect for a Valentine Day supper. In a skillet over medium heat, heat 2 tablespoons olive oil. Cook shrimp, garlic and white wine for 4-5 minutes or until shrimp is pink. Do NOT overcook! Remove shrimp with slotted spoon and set aside. Bring a large pot of lightly salted water to a boil. Add pasta and cook for 8 to 10 minutes until al dente; drain and keep warm. While pasta is cooking, place diced tomatoes and halved grape tomatoes with remaining 1 tablespoon oil, balsamic vinegar, oregano, and basil over medium heat into wine mixture in skillet until tender—10 minutes. 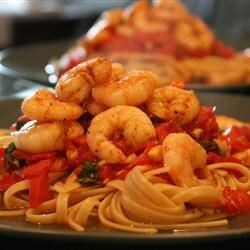 In a large bowl, toss hot pasta with shrimp, tomato mixture, and feta. Feta will melt slightly. Serve immediately with lemon wedges and a crusty bread. Prefer chicken? This dish is packed with flavors sure to spark up any evening! Sauté mushrooms in large frying pan with 1 tsp of the oil, until just browning. Remove from pan, set aside. Heat 1 Tbsp oil over medium­-high, add green beans. Sauté until green beans are cooked, but still a bit crunchy. Remove from the pan, set aside. Heat remaining 1 Tbs oil over medium-­high, add chicken, salt, and pepper. Cook chicken 3­-4 minutes on both sides and remove once browned & cooked though. Remove from pan, set aside. Whisk all dressing ingredients together. In the same skillet, lower heat to medium, add dressing, honey, and balsamic vinegar. Stir and heat until bubbling. 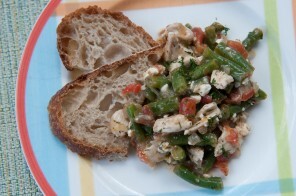 Toss in mushrooms, and green beans then the cooked chicken and tomatoes. Stir to heat through. Serve over rice or pasta. This takes on a romantic hue when served with champagne. If made ahead, keep the chocolate warm in a double boiler till ready to serve. In a small saucepan, over low heat, warm the cream and chocolate. Stir until the chocolate melts. Transfer the fondue to a warm serving bowl or fondue pot. Serve immediately with forks for dipping strawberries, angel food cake, or whatever you like. So easy to put this together ahead of time. Kids will especially love the flavors. Combine the cocoa, cinnamon, cornstarch, and 2/3 cup of brown sugar in a heavy saucepan. Whisk in milk and 1/2 cup of cream. Bring to a boil and cook over medium-low heat, stirring constantly, until pudding is thick and smooth. Whip remaining cream in a separate bowl with the remaining sugar until soft peaks form. Pour pudding into individual ramekins or a large bowl and press plastic wrap directly onto the surface to prevent a skin from forming. Serve warm or chill for at least two hours. Top with raspberries and whipped cream.